Stephen Worth, who runs the invaluable ASIFA-Hollywood Animation Archive, wrote to tell me that he has posted a large number of high quality scans featuring the pre-Golden Book art of Gustaf Tenggren. In 1940, the great European children's book illustrator, Gustaf Tenggren left the Disney Studios where he had been instrumental in establishing the style of "Snow White" and "Pinocchio". He was disgusted with Disney and unsatisfied with his style, which was based on the classic tradition of illustrators like Arthur Rackham and Edmund Dulac. Tenggren resolved himself to brand his name the way Disney had, and to streamline his style to suit the American market. 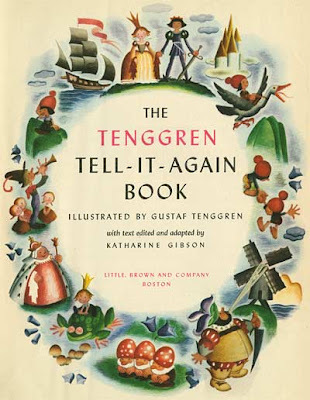 He published a book in 1942 called "Tenggren's Tell It Again Book", which not only reestablished Tenggren as an artist of note, it marked the genesis of the style of illustration that became known as the classic "Golden Book style". Tenggren followed up this book with "The Poky Little Puppy", "The Tawny Scrawny Lion" and "The Saggy Baggy Elephant", the first three books in the Little Golden Book line. He had reinvented children's book illustration and he never lookhttp://www.blogger.com/img/gl.link.gifed back. But the interesting thing about the story is where the inspiration for this new American style came from... It came from his Swedish heritage. In two posts on the ASIFA-Hollywood Animation Archive blog, I present a bunch of incredible images from "Tenggren's Tell It Again Book" to chart Tenggren's evolution from a traditional European illustrator to the new, quintessentially American Golden Book style. Enjoy!